Many people enjoy living the expat life in the Middle East, but Ramallah, Palestine, is not generally known to be an expat haven. 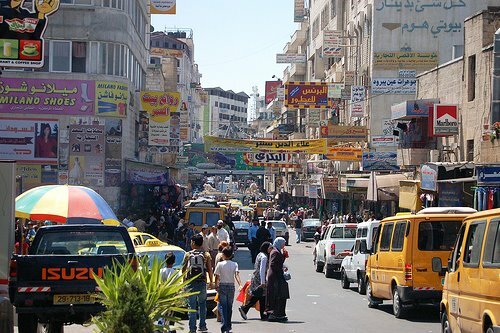 However, an American foreign aid project brought us there and we enjoyed living in Ramallah for a couple of years, loved the people, the food and the ambiance of this exotic little town with its narrow winding streets lined with small shops selling Middle Eastern sweets, jewelry, household goods, meat, and so on. Like everywhere else, young singles here look for romance, love, and happiness ever after. Here’s a story about looking for love, with a little local color. I’m having lunch with a few friends in a small boutique café in Ramallah, eating Greek salads piled high with feta cheese and lots of olives. Although we love shwarmas, falafel, hummus and all the other wonderful local fare, once in a while we treat ourselves to a lunch at this trendy little eatery. My friend Marianne is a Danish redhead with big blue eyes and a delicate problem: Her Palestinian colleague Amira is putting on the pressure for Marianne to consider marrying her handsome brother, Marwan. Marwan is looking for a wife, which is not that easy in Ramallah, as it is not so easy anywhere in the world. His sister is doing her best to aid in his quest. She tells Amira that, having met the marvelous Marwan only once in passing, she’s not convinced she knows him well enough to start considering marriage, and besides she doesn’t want to get married yet. The wrong thing to say. How can she not want to get married? Doesn’t she want a husband? Children? A home of her very own? And so on and so forth. Yes, says Marianne, but not just yet. But Marwan is so wonderful! Amira cries out, and again catalogues her brother’s good qualities, his education, his handsome face, his generosity. Really she should think about it. She should get to know him, meet with him. Marianne says no thank you. She wants to travel more before she settles down on a cold Danish island without hummus. She doesn’t want to get romantically involved just yet. She’s too busy with her job with the water-project here, too busy discovering the world. Later that week my spouse and I are invited to dinner at the house of Samir, a new Palestinian friend who spent his university days in Georgia, USA, getting an engineering degree. He is single. Living the bachelor’s life in Ramallah is a bore, he tells us as he uncorks a bottle of wine. He’s ready to be married and he’s looking for a wife, but it’s not easy here. His mother is looking for a suitable girl. His sister is looking. He rolls his eyes. Then he sighs forlornly. He has a nice apartment in a new building. The furniture is of the dark and well-stuffed formal variety, but a full complement of silvery gleaming electronic equipment–TV, CD player, VCR — brightens the decor. There are five of us, the other guests mutual English friends. We are offered wine and nibbles, the usual pre-dinner munchies of nuts and seeds and olives. We talk about this and that — Russian cars, scorpions, travel, and airports. I’m off to Holland next week to visit my family. I ask Samir if there’s something I can bring back for him. Chocolate? Cheese? Pickled herring? While we talk, Samir runs in and out of the kitchen where he’s fixing us musakhan, a traditional Middle Eastern oven-roasted chicken dish. He’s doing the cooking himself and I tell him I am very impressed. He laughs. He has a very nice laugh. Also he’s handsome and has great hair. He’s a catch, as my daughters would say. My daughters, however, are far away, and taken. The musakhan is delicious, served in a flat dish lined with layers of lavash, a very thin bread that’s baked in large sheets. On top of the bread is a thick layer of onions fried in lots of olive oil and on top of that lounge chicken pieces seasoned with plenty of red lemony sumac. The right way to eat the dish is with your fingers. You tear off a piece of bread and use it to scoop up a piece of chicken. Nice and messy for those of us not used to eating this way, but much fun. So here we are, thoroughly enjoying the food and the company and Samir’s funny tales, one of which involves his sitting in a park in Georgia, USA, on a hot summer day enjoying the quiet and smoking his narghila. “Peach tobacco, sir.” Samir shows him the package. Pretty picture of peaches, lots of Arabic squiggles, sticky narghila tobacco inside. In Georgia, they know their peaches. NOTES: In some countries you’d better have a couple of goats or other livestock if you want to get yourself a bride. Or soap or gold or cases of Johnnie Walker. Do you have any fun stories about the trials and tribulations of finding a mate and what is needed to marry in places where you have lived as an expat? Hit that comment button and entertain me! I so much enjoyed your two entries about Palestine. Sadly all we ever see on the television is about the conflicts there and the misery in which the people seem to live, and so to read that they do also enjoy normal lives – apart from the lack of tension rods – cheered me up. I lived in Georgia for many years, and I certainly can’t see the cops passing on that one!! Classic lines: In Georgia, they know their peaches… and Does he have a microwave. Ahh the joys of getting to know the locals. LOL In Delhi we often listened to friends bemoan the number of setup teas their parents dragged them to. I never heard the microwave line before though….